There is no actual caption - this photo has been killed by Reuters! As if we can believe anything they'd put in the caption anyway. Tell us what Reuters should have put in the caption if they were, you know, honest. I admit this will be a hard one to caption, but maybe you can win acclaim for writing the definitive caption for the most infamous photo of all. Entries will remain open until 11:59 PM, Central Standard Time, Tuesday, August 15. Submit your captions in the comments section, or email at mccracken.ken@gmail.com. He may be keeping the stiff British upper lip, but other features required closer scrutiny. Prince Charles was determined to find his last shred of dignity, even if it took resorting to the most drastic of measures! An elated Prince Charles reacts to news that the fine print in his wedding agreement allows for concubines. Worth a look, but still not king size. Now that he has found his willy again, Prince Charles will now go forth and finally consumate his marriage. Captioning is too important to be left to Reuters. Enter today! "When Are The Adults Going To Be In Charge?" Reuters announced today that Mel Gibson has been chosen to head up their photojournalism department. "The Annual Beirut Street Fair Is Getting A lot Of Attention But Attendance Is Down This Year." Hezbollah and Reuters presented new architectural mock ups of the ovens they plan to operate in Beirut. "Rocket attacks have not been nearly efficient enough at killing Jews, so despite the fact that we deny the holocaust ever occurred, we have much to learn from the Germans." Plumes of smoke...Oh man, we really need to hire somebody a little more adept at photoshopping so bloggers like Rusty Shackleford, Charles Johnson, and Jeff Harrell can't call us out so easily. Modify the above comment to remove the redundancy please. Was distracted while making it. 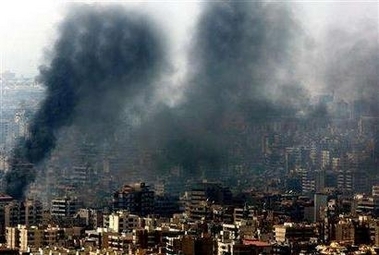 Adnan Hajj captures his rendition of the great smokey divide between the media and what is actually happening in Lebanon. Adnan Hajj Productions. We photograph weddings, funerals, and special events of all kinds. "For god's sake, this is EXACTLY why I told you: when Ken McCracken asks you to pull his finger, DON'T DO IT!!!!!!" "More smoke! MORE smoke, dammit!!" Reuters' credibility goes up in smoke. Thanks for last week, Ken.